Live Float Ltd. commissioned Studio Augustin to design an affordable and environmentally responsive narrow boat for use on London’s waterways. What grew out of the exercise was an attempt to respond to the growing problem of double and triple mooring as people continued to attempt to stay as centrally located within the city as possible. Identifying a series of fallow canal-side strips of land along the Lee Navigation route a concept emerged for a vertical mooring structure. 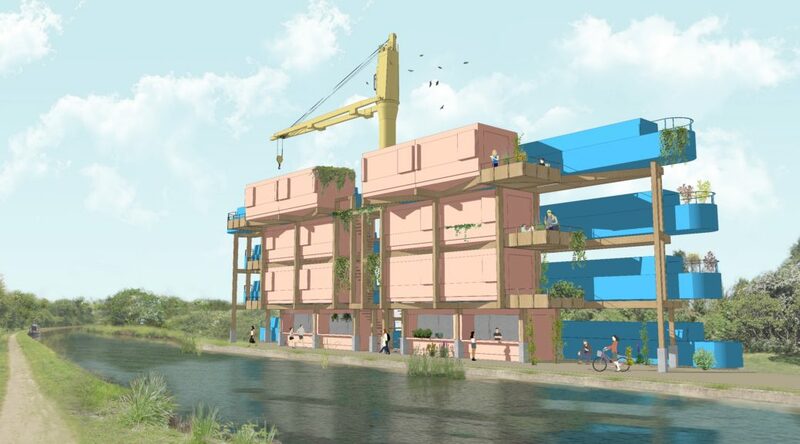 The structure provides a framework for canalboat users to rest from the stresses of continuous cruising and gives space for single people and couples to put down roots, grow into larger family units and form a unique community environment adjacent to the waterside. When taken out of the water the narrowboat provides an neat and compact service spine off of which larger inhabitable rooms can be served. The vertical mooring offers flexible living with the comfort of knowing that should relocation be necessary or a return to travelling the waters desired, one can easily be craned back into the water allowing the home that has been developed to be taken to the next destination. The ground floor units providing opportunities for small businesses and workshops to serve the neighbouring community. With the help of Live Float the project is currently under consultation with various authorities and is undergoing detailed design development of a prototype structure with the ambition for a network of vertical moorings to be set up accross various waterways throughout the UK.